National Front politicians appear to be working with a large international network of internet trolls to manipulate French social media. Une version en français de cet article est disponible sur BuzzFeed France. 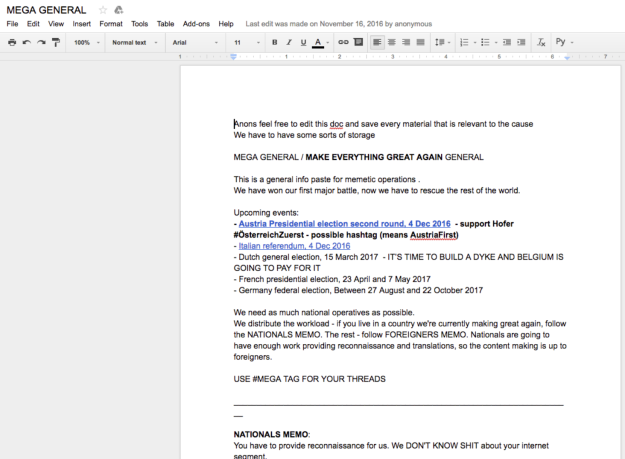 Last month BuzzFeed News was briefly given access to a chatroom called The Great Liberation of France, which is hosted on a Slack-like messaging platform called Discord. Discord has quickly become a popular Skype alternative for gamers and anime fans. In the last year, it has ballooned from 3 million to 25 million users. It’s also become ground zero for neo-Nazis, far-right groups, Trump supporters, and supporters of France's far right party, the National Front (FN). The Great Liberation of France and its French-language equivalent La Taverne des Patriotes are hotbeds of far-right activity in France. You can see their influence all across the internet. For instance, in a recent thread called #MFGA General — or "Make France Great Again" — on 4chan's /pol/ message board, users were making jokes about a music genre called "vaporwave" and discussing whether they should spread a version called "Marinewave" named after Marine Le Pen, the leader of the National Front. But that image actually originated in La Taverne des Patriotes, which was created by a user named Chepamec, a pro-FN Discord user who also moderates the r/Le_Pen Reddit community. Chepamec is also the owner of a Twitter account with the same name and a member of an online community called 18-25, hosted on a website called Jeuxvideo, which is like France's 4chan. In January, the 18-25 message board on Jeuxvideo set up an official thread supporting Marine Le Pen, done with the approval of the site's moderators. Invites to the La Taverne des Patriotes Discord server appear regularly on the official National Front Jeuxvideo thread. Its members regularly promote it on the Le Pen thread. Chepamac and The French Resistance appear to be two of the most active users within France's spiderweb of anonymous far-right communities. Both agreed to speak to BuzzFeed News. BuzzFeed News, which is currently using a Discord account named Flavortown, interviewed The French Resistance and Chepamec this week about how their group appears to be easily manipulating French social media. Chepamec and The French Resistance claim that while their group borrows heavily from tactics used by Trump supporters and is helping train Americans to spread National Front memes, they ban racism and anti-Semitism. The French Resistance identified as Jewish. Both users told BuzzFeed News that they're 22 years old and that they support the National Front because of the party's hardline anti-immigration policies. 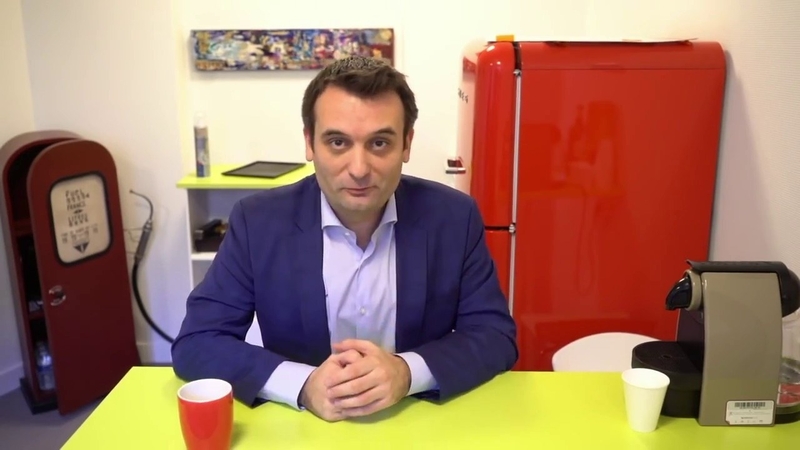 Right now, one of the most popular memes among young, internet-savvy National Front supporters is a red coffee cup that Florian Philippot, the National Front’s second-in-command, has been regularly using in his recent YouTube videos. 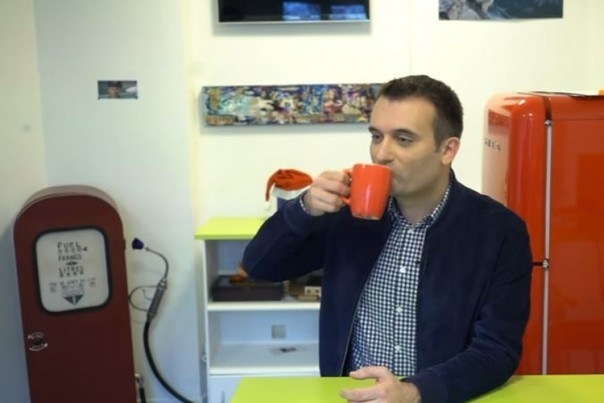 In America, Philippot's red mug would be the equivalent of someone like Kellyanne Conway wearing a Pepe the Frog pin on TV. It is memes like this that are included in an explainer Google Doc and database that Chepamec and The French Resistance shared with Trump supporters on Discord. This system allows trolls to appear French and support the National Front without actually having to speak French. They also claimed that in just two weeks, they've grown their Discord group to almost 400 active members. 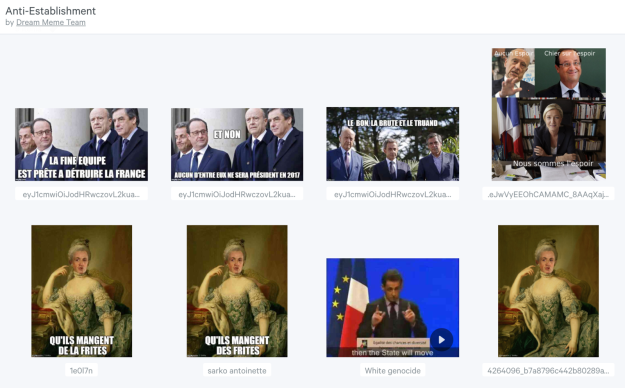 The size of their server now means that the group can manipulate trending topics in France, they said. On Dec. 3, 2016, Grégory Roose, a local politician affiliated with the National Front, announced an "operation" called #SauvonsNosSDF. The project was meant to promote the building of “small wooden houses” to support French homeless people, as opposed to giving aid to migrants. Quickly, a Twitter account called @Patriosphere launched to action, promoting the hashtag. That same day, an English-speaking user announced in The Great Liberation of France that everyone should help promote the hashtag and make it go viral. A prominent user in both The Great Liberation of France and La Taverne des Patriotes goes by trumpwin2016. This user has been instrumental in helping Trump supporters coordinate online with French voters who support Le Pen. BuzzFeed News has attempted to contact this user several times. Trumpwin2016 owns a Twitter account with over 4,000 followers called @nelsonian210. On Dec. 3, after the call went out on Discord, that account began spreading the #SauvonsNosSDF hashtag as well. Soon, another account began tweeting with the same hashtag. An account called Haute Énergie, which is followed by Marine Le Pen and owned by an English-speaker, also spread several messages with the hashtag #SauvonsNosSDF. Here’s the account's most successful tweet from Dec. 3, with nearly 150 retweets. The next day, Belgium-based researcher Nicolas Vanderbiest tweeted an analysis of operation #SauvonsNosSDF. According to Vanderbiest, more than 40,000 tweets were generated with that hashtag. While BuzzFeed News was inside The Great Liberation of France, an English-speaking Discord user called don said he had been added to a Twitter DM group called Council of Patriots. He said the Twitter DM group included National Front members. In these screenshots, Grégory Roose directly communicates with the far-right internet trolls who are organizing on Discord. In other screengrabs posted by don, Roose explains that higher-ups within the National Front would be briefed on the success of operation #SauvonsNosSDF. Roose told BuzzFeed News that he did call on influential accounts in the "patriosphere" — or the far-right French Twitter community — to spread his hashtag. He also said that he's not always on the same page as they are, but does communicate with them directly. "They helped me out with a project. It's a small group of tweeters who are completely independent. For #SauvonsNosSDF, they provided a lot of help, but there was real independence," he said. "I'm part of a small discussion group on Twitter, but I don't spend all my time on it," he said. "It's an interesting group that has had an enormous impact, for better or worse." In October, BuzzFeed News was accidentally added to a similar one of these "patriosphere" DM groups full of National Front-affiliated Twitter accounts. Here's a screenshot of a message BuzzFeed News received asking users to boost the hashtag #Patriosphère. And here's another one that went out, asking users to swarm and harass French TV host Laurent Ruquier, who was accused of being anti-patriotic. 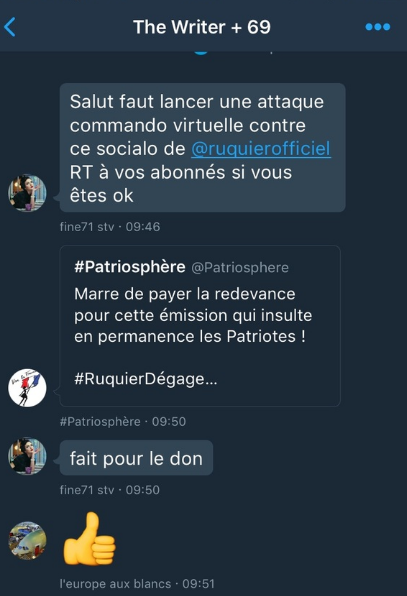 It also appears that official National Front members are reaching out to anonymous trolls via other social media sites like Jeuxvideo. 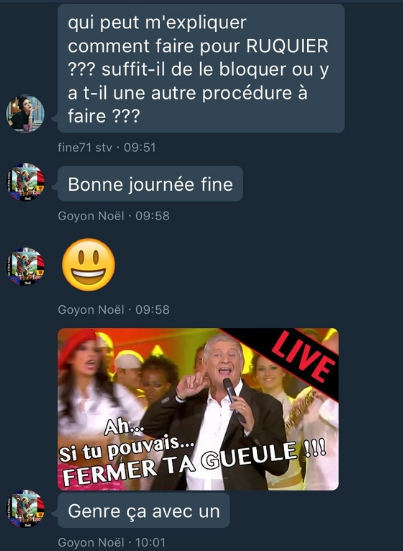 Here's a screenshot of a Jeuxvideo user called ÉtatDeSavoie_26 messaging with an account that appears to belong to Éric Richermoz, a National Front secretary who is also part of Philippot's filming crew. In the US, this would be the equivalent of a high-level member of Trump’s staff actively posting on 4chan during the election campaign. Members of La Taverne des Patriotes believe they can now easily manipulate French social media. Earlier this week, Chepamec and The French Resistance told BuzzFeed News that they planned to once again make a hashtag go viral in France. The hashtag was #JeChoisisMarine, or "I Choose Marine." Inside their Discord servers, both French and American users were encouraged to use their network of dummy Twitter accounts to push the hashtag. And according to screenshots they provided BuzzFeed News, they believe their Discord servers were responsible for the fact that #JeChoisisMarine briefly became the No. 1 trending topic in France and the fourth-highest trending topic in the world.